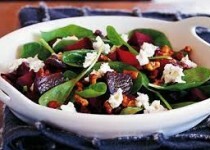 Colour your salad red with this healthy delicious meal in a bowl. Walnut or Canola Oil - 2 Tbsp. Real Maple Syrup (the darker the syrup the better) - 2 Tbsp. Coarse-Grained Mustard - 1 1/2 tsp. Apple Cider & Garlic Vinaigrette - 3 Tbsp. Place chicken in a small skillet or saucepan and add enough chicken broth to cover; bring to a simmer over high heat. Cover, reduce heat and simmer gently until the chicken is cooked through and no longer pink in the middle, 10 to 12 minutes. Transfer the chicken to a cutting board. When cool enough to handle, cut into 1/4" thick slices. Meanwhile, whisk, oil, syrup, mustard, Apple Cider & Garlic Vinaigrette, salt & pepper in a large bowl. Reserve 2 tablespoons dressing in a small bowl. Add spinach to the large bowl; toss to coat with dressing. 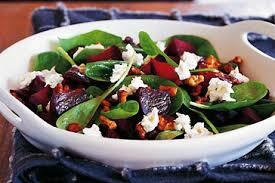 Divide the spinach between 2 plates, top with the chicken, beets, goat cheese and pecans. Drizzle with the reserved vinaigrette.